Peel and chop celery root, leek, shallots, and carrot. Peel ginger and cut into thick slices. Peel and halve garlic clove and finely slice pickles. Zest a lemon and set aside. Transfer beef shanks on a cutting board and season with salt, pepper, and Piment d'Espelette. Spread some tomato paste and Dijon mustard evenly on each shank, then top each with prosciutto and sliced pickles. Roll up tightly and tie each roulade together with kitchen twine. Heat some olive oil in a cast iron roasting pan over medium-high heat. Add roulades and fry on each side for approx. 1 – 2 min. until browned. Season with salt and pepper, then remove from roasting pan and set aside. Heat more olive oil in the roasting pan and add the celery root, leek, shallots, carrot, ginger, garlic, and lemon zest. Fry over medium-high for approx. 1 min., then add remaining tomato paste and fry for approx. 1 min. longer, or until the paste starts to darken. Deglaze with some red wine and stir for approx. 1 min. to scrape any bits and pieces off the bottom of the pan. The red wine should be just about gone. Repeat about 4 times. Transfer beef roulades back to the roasting pan and cover with remaining red wine and beef stock. Close the lid, bring to a boil, then reduce the heat and let cook for approx. 90 min. Add cloves, allspice berries, and black peppercorns to a tea egg and place it between the roulades. Add lovage and the bay leaf, then cover again and let cook for approx. 60 min. or until the meat is tender. 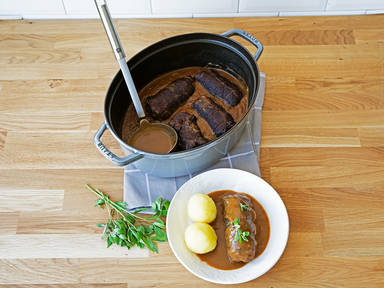 Transfer beef roulades back to the roasting pan and cover with remaining red wine and beef stock. Close the lid, bring to a boil, then reduce the heat and let cook for approx. 90 min. Add cloves, allspice berries, and black peppercorns to a tea egg and place it between the roulades. Add lovage and the bay leaf, then cover again and let cook for approx. 60 min. or until the meat is tender. Remove the tea egg and bay leaf and transfer the beef roulades to a plate. Cover to keep them warm. Add leaves of marjoram, sage, and rosemary to the roasting pan and blend until a smooth sauce forms. If needed, add some water until the desired consistency is reached. Season with salt, pepper, and elderflower syrup to taste. Mix starch and water in a small bowl and add to the sauce. Let it simmer and thicken for approx. 5 min., then transfer the beef roulades back to the roasting pan. Serve with potato dumplings and sauce. Enjoy!